On the tenth day of Christmas my green friend gave to me…10 native plants, 9 organic wines, 8 backyard hens, 7 LEDs, 6 fair-trade chocolates, 5 faucet aerators, 4 solar lights, 3 large rain-barrels, 2 new thermostats and a live…Christmas tree! Ten native plants…what a great gift for someone choosing to transition their “thirsty” landscape into a drought tolerant yard! Whether you live in a wetter or drier part of the country conserving water with native plants is the best type of landscaping possible. A climate-friendly landscape minimizes the need for fertilizers and pesticides which reduces pollution in our water. Every state has tools available to help you design the best water-conserving landscape for your climate. If you have trouble locating the tools to help you, search for a native plant organization or nursery to get assistance. I mentioned thirsty yards and such on the Third Day of a Green Christmas after receiving 2 large rain-barrels. I have been working on converting my yard to “native” plantings for the past year. Now I have 10 native plants to add to my landscape. 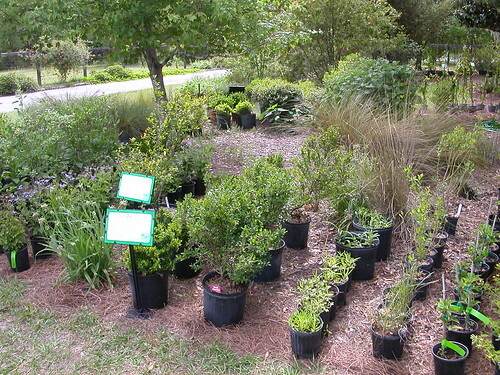 Keeping in mind the FFL (Florida Friendly Landscaping) number one principle…Right Plant, Right Place…I have sorted my plants into ground-covers and specimens, based on watering needs. I can then place the plants in my yard where they will thrive best, following the 9 FFL principles in Landscaping 101. To get the help I need I use the FFL Interactive Yard tool on my computer. My green friend knows my yard and knows I have a low-lying area that collects water when it rains so a couple of the plants are perfect for my newly created rain garden. Adding the 3 rain-barrels to my already existing 4 rain-barrels and 2 rain-chains I have several areas of my yard that will be able to receive more irrigation with drip hoses. A drought-tolerant yard looks like a 2014 reality for me. I hope you will think “native” when adding or replacing any plants in your yard this year and please avoid using any invasive plants!